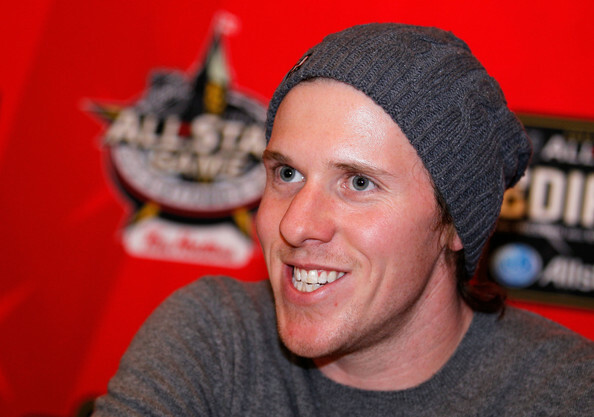 Former UMaine hockey standout and current goalie for the Detroit Red Wings, Jimmy Howard, returns to Orono on Friday for a fan meet and greet at the newly opened Maine Savings branch on College Avenue. The appearance is not just part of promoting the new bank location, but also to highlight a new partnership between the savings institution and UMaine Athletics. Maine Savings has been named the exclusive issuer of the “Black Bear Debit Card” which will provide a donation back to the Black Bear Fund with every swipe of the card. The partnership promises a minimum of $10,000 in contributions to the fund each year for the next five years which is the length of the current agreement with Black Bear Sports Properties. The fund is used to supplement scholarships for student athletes who may not otherwise receive a full scholarship for athletics. While events have been going on all week at the new branch located at the corner of College and Stillwater Avenues, the highlight of the festivities is clearly the return of the Black Bear’s best goalkeeper of all-time, Jimmy Howard. Playing three seasons in Orono and leading the team to the 2004 NCAA National Championship game, Howard set school, Hockey East, and college records for his net-minding skills. Howard has been the starting goalie for the Detroit Red Wings since the 2009/10 season and was named an All-Star in 2012. So if you are looking to meet a living legend in Black Bear sports, head down to Maine Savings on Friday from 1:30pm to 4:30pm to get an autograph from Jimmy Howard. And if you happen to snap a picture, tweet it to us at @FillTheSteins and we will share it with our followers.